From the mind of Takashi Shimizu, the director responsible for both the Japanese and American versions of The Grudge and The Grudge 2, comes Tormented. New on Blu-ray, viewable in either 2D or 3D, it’s a horror movie that manages to turn an oversized Easter bunny costume into a twisted symbol of demented horror. At 83 minutes, Tormented is an easy film to sit through, coasting along more on atmosphere than actual plot. Hikari Mitsushima turns in a haunted performance as Kiriko, a young woman who lives with her younger half-brother Daigo (Takeru Shibuya) and their father Kohei (Teruyuki Kagawa). Who’s tormented? Seems like all three are, but we don’t know why initially. 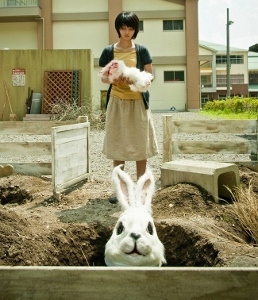 Daigo crushed the skull of a dying rabbit at school and ever since has been having rabbit-themed nightmares. The obvious answer would be that he’s tormented, but Kiriko and Kohei have issues too. I certainly won’t reveal the main twist that the whole affair hinges on, but I will say it’s a good one. The problem is that the after Shimizu reveals the true nature of the problem shared by his three leads, there’s nothing more to say. The third act manages to turn a moderately compelling horror film into something of a shaggy dog story. That’s a shame because the first hour is well-staged, with a good deal of unsettling imagery. I only watched Tormented in 2D and was underwhelmed by the visual presentation. Audio-wise, the DTS-HD MA 5.1 mix has some interesting effects that keep things sonically unpredictable. But the cinematography by Christopher Doyle is almost hazy at times. Scenes outside Daigo’s school (at which Kiriko works) deliver the clarity we expect from the high definition format, but darker scenes (particularly the dream sequences) are a bit lacking in fine detail. By no means a huge problem, Well Go USA’s Blu-ray of Tormented sounds good and looks just average. No special features here, so Shimizu fans should be prepared for disappointment. The 2D/3D hybrid disc is priced reasonably though and I think Japanese horror fans will want to give it a spin. I love horror films and this is the first review I’ve read of this one. Maybe you could offer it as a giveaway? hint hint. It looks like one I would love to add to my collection.